M&N Brands, the holding company that owns Avatar Johannesburg, Avatar Cape Town, Avatar Media Agency, Avatar PR, Mela Events and Bozza, has started 2019 with the establishment of M&N Entertainment, and the acquisition of Zkhiphani.com – a youth entertainment portal with 100 000 visitors per month. Group CEO of M&N Brands, Zibusiso Mkhwanazi, says, "The M&N Entertainment division will house all the TV and content publishing business, including the latest acquisition. Zkhiphani celebrates its 10 year anniversary in April, and we are thrilled to be part of the next chapter of their success story." "Over and above the visitors we get to the site, we also have a collective social media following of 2.7 million impressions, which really puts us at the forefront of South African youth culture," says editor in chief, Andile Mathobla. "Our pay-off line is ‘we are what’s happening’, and our team of nine people keep our brand relevant and impactful," says Mathobela. Mathobela adds, "We are very excited about this partnership. After 10 years of independence in the game, we feel that we have to take things to the next level by partnering with like-minded game changers like Zibusiso Mkhwanazi and Veli Ngubane [co-founders of M&N Brands], who have built amazing businesses in the digital and advertising space in recent years. We are confident that they will take Zkhiphani.com to a whole new level." 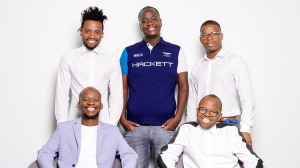 Mkhwanazi says, "M&N Brands is about value-adding partnerships, and we believe we can combine resources to accelerate the portal’s growth, and provide advertisers with competitive offerings to better engage with young people in South Africa." "I am especially excited about further investing in online publishing, with the long term goal being to consolidate our online sites into a video-on-demand service for Africans, by Africans," Mkhwanazi concludes. For more information, visit www.mnbrands.com.